Less than two years after the opening of Bayfront Park, the Miami city manager recommended that the park acquire a larger bandshell to replace the bandstand that was constructed during the opening ceremonies for the park. 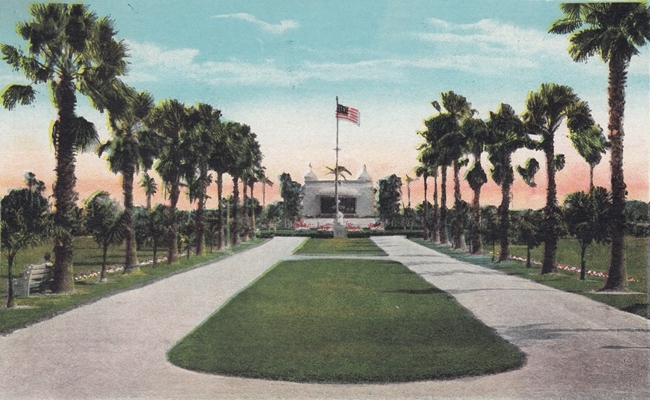 The first approach was to relocate the bandshell located at the privately owned Royal Palm Park, which was situated to the west of Bayfront Park. The move took place in February of 1928. However, within a month of the move, the bandshell caught on fire and was damaged beyond the point of repair. The following morning, the city commission ordered a new bandshell to be erected immediately. The new building was complete in time for the Shriner convention that began in May of 1928. The bandshell served Miami for nineteen years before it was ordered to be torn down by the city commission. On February 12, 1947, it was condemned by the city engineer. However, it wasn’t razed until 1949. The replacement bandshell was built and unveiled in 1950. It was modern, larger and provided better acoustics than the 1928 facility. It opened on the city’s birthday (July 28), in 1950. A more detailed article on the history of the Bayfront Park Bandshells will be posted soon.